Melody is the voice-activated assistant that lets you experience popular music services with simple voice commands and works with hundreds of Bluetooth headphones and speakers. We are bringing innovation in voice technology and artificial intelligence to deliver hands-free and eyes-free audio entertainment to the masses. Speak Music today announced the launch of Melody, a new voice enabled platform that gives music lovers the ultimate hands-free listening experience via a free iOS app. Melody is a personal music assistant with access to millions of songs and thousands of radio stations. Melody lets users connect with a vast selection of audio and musical content while multitasking, driving and working out. With Melody, consumers can just request what they want to hear on the app or a connected Bluetooth headphone or speaker and start enjoying practically any song or artist that they can think of. Melody connects to most Bluetooth audio devices such as headphones, Bluetooth speakers and newer automobiles that have Bluetooth audio streaming capability. The music behind Melody comes from popular music streaming services such as iHeartRadio and Spotify Premium. Melody is available today in the iTunes App Store as a free download, and the Android version is following later in the quarter. Totally mobile and available on the go with no Wi-Fi or AC power required. A personalized experience that uses artificial intelligence, which gets smarter over time as it learns your preferences and plays music based on your individual taste. Access to thousands of iHeartRadio’s Live Radio stations from across the country and custom Artist Radio stations plus Spotify’s extensive track, playlist and artist library. Melody’s music discovery system provides a natural language method for finding music by song, album, artist, playlist, genre, radio station, mood, activity, instrument and more. Support for Bluetooth headphones and speakers (including hands-free Bluetooth mode), AirPlay and compatible car controls. The Founders of Melody bring relevant experience from companies like Google, Zynga and Ericsson and are executing on a mission to transform and simplify how people discover and consume audio entertainment in a multi-tasking society. Speak Music is already partnering with Bluetooth device makers such as iHome that will bundle Melody’s voice technology and access to millions of songs to the market at a variety of price points and devices at major online and retail locations. 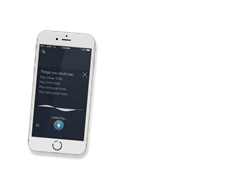 Speak Music is redefining the consumer mobile music experience—with Melody, the industry’s most advanced voice powered music assistant, it is putting the power of voice to work for consumers to play any song, artist, playlist or radio station with a simple voice command. Powered by natural language processing and artificial intelligence, the Melody Platform enables hands-free access to popular music streaming services – iHeartRadio, Spotify Premium, NPR and more. Speak Music was founded by Zak Mandhro, Mark Anderson and Dean Summers - serial entrepreneurs from Google, Zynga and Ericsson who bring rich experiences to its strategy and product innovation. Speak Music closed its first round of financing in 2016. For more information on Speak Music and Melody visit Melodyapp.ai, on Facebook https://www.facebook.com/melodyappai/ or follow @MelodyAppAI on Twitter.